We should all have a sensible backup plan and part of that should always be off-site backup. This could take the form of a hard drive stored away from your premises, but there are an array of online cloud hosting backup services that make it even easier to safeguard your precious files in the event of a disaster. My choice of cloud backup provider used to be Mozy, enticed by its unlimited upload limit. While perfectly adequate it always riled due to a really poor Mac app that drained the computer’s resources as well as hogging the internet connection (despite a throttling system). So when EMC announced that Mozy was going to be ending its unlimited backup feature in place of a per-GB subscription the decision to leave was easy. Since then I’d been using the off-site external HDD system, rotating two drives between my house and work on a monthly basis. Combined with my most important current files living in Dropbox, this seemed like a sensible method. However, after the launch of my freelance business, I began looking for a cloud backup service to provide an extra level of security again. Back in 2011 when Mozy changed subscription plans I tweeted my frustrations and within hours two other services both replied to me with discount codes. While that’s not difficult marketing, it’s a nice touch that stuck in my mind. The two services were CrashPlan and Backblaze. 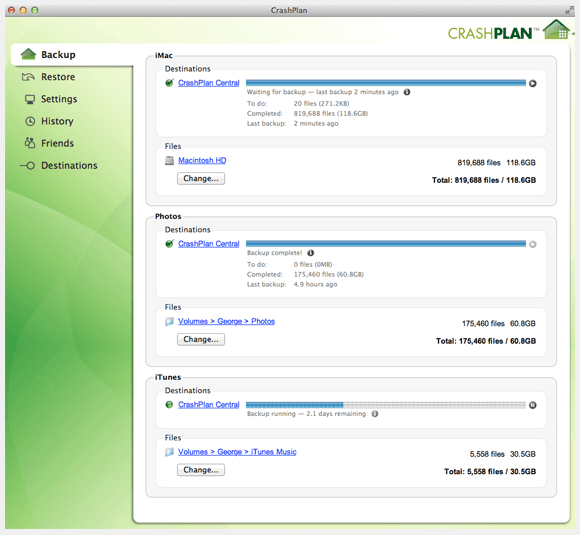 Just on the strength of CrashPlan’s website design alone I could’ve chosen them, but I decided to compare them and Backblaze, along with Carbonite and (for fairness’ sake) Mozy again. From the table above you can seen each service has it’s own perks and let-downs. Mozy was immediately still ruled-out because of the aforementioned data limit, only 50GB on the basic plan. I’m not a heavy user by any means, but want to be able to backup without worrying about extra costs. Backblaze looks great and comes highly recommended, but unfortunately the lack of NAS drive support ruled it out. All our iPhoto and iTunes data is stored on a Time Capsule, which is essential to backup. Unfortunately this is the same for Carbonite, which only allows NAS support for ‘Pro’ Accounts. That just left CrashPlan. It only failed on one count in my necessity list, a non-native app, but nevertheless I gave the trial version a go. On installing, it immediately became apparent that this was going to be a major problem with the CrashPlan Mac app running on Java and virtually hogging my whole system as it did it’s first scan. Strangely too, it contains completely different branding to their sparkling website. Having tweeted about this I received a reply very quickly from the guys at CrashPlan promising a new native app, which again is great customer service. Providing it materialises soon, of course. In fact the main application is actually more of a preferences and setup panel as the backup is handled by a small Menu Bar app that takes virtually no memory at all. The app allows you to adjust most things as you’d expect including, bandwidth allowance, scheduled backups and security options. The most useful feature though is ‘Sets’, which make it much easier to control your uploads. Rather than sending 400GB in one go, you can divide your backups into smaller chunks of selected folders (photos, music, documents etc) and set priorities so if certain areas are more important to backup they will be completed first. Two months into using Crashplan and I’m very pleased. The backup is completely unobtrusive and has never hogged my internet connection. While it did take a while (around a week) to backup my first 100GB it seems to be running smoothly. Uploads speeds can obviously fluctuate due to ISP and CrashPlan’s servers, although there are a couple of tips that might help you speed it up a touch. I’ve been getting up to 5mbps, averaging around 1.5mbps. When the new native Mac app will appear is anyone’s guess, but hopefully soon. Similarly as with Mozy, you can’t guarantee CrashPlan will stay ‘unlimited’ forever but here’s hoping, as it seems to be a good reliable backup service.